SOMERVILLE — The Inner Belt, a sparsely used industrial district in a corner of East Somerville, is about as inviting as its name, cut off from surrounding neighborhoods by railroad tracks, elevated highways, and a massive maintenance facility for the MBTA’s commuter rail. With the coming Green Line extension into Somerville, city officials see an opportunity to remake the area — created decades ago to serve an interstate that was never built — into a thriving hub of housing, offices, shops, and, potentially, a sparkling new stadium for the New England Revolution. The owners of the Revolution believe a new stadium here would raise the team’s profile by relocating from Gillette Stadium, the cavernous Foxborough home the team currently shares with the New England Patriots. It would put the team within easy reach of neighborhoods packed with immigrants from soccer-obsessed countries, young urbanites looking for accessible entertainment, and suburban soccer families with train connections to North Station. Team owner Robert Kraft and his Kraft Group first floated the idea several years ago, but it had been on hold because of uncertainty over the Inner Belt. The state and city have tussled over the area for nearly two years while determining where to build an 11-acre, 24-hour maintenance facility needed to serve and store the vehicles that will run along the Green Line route extending beyond Lechmere to Somerville and Medford, a nearly $1 billion project the state says it will complete by 2015. A compromise announced in May by city and state officials to put the Green Line service facility not in the middle of the Inner Belt but along its eastern edge, near the existing commuter rail yard and barn, has allowed the Kraft Group to refocus on the area as a potential site for a roughly 20,000-seat facility. 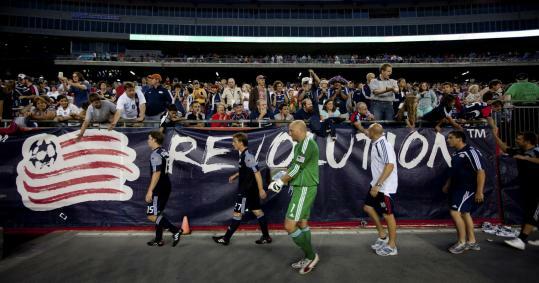 That facility would give the Revolution a more intimate stadium in the metropolitan area and double as a concert venue. The Krafts have invested more than $1 million already to explore that site and three others around Boston, the Revolution’s chief operating officer, Brian Bilello, said recently on the team’s blog, answering questions from fans hungry for a venue closer to Boston and public transit. “During the next few months our architects and engineers will be studying the area to determine if it is possible to build a soccer stadium,’’ wrote Bilello, a former MIT soccer player and management consultant who joined the Kraft Group in 2003. Bilello said that building a stadium for the Revolution is “a top priority’’ for the Krafts, the team, and the league. When Major League Soccer began in 1996, most teams played in football stadiums that put fans far from the action and swallowed up the typical crowds of 10,000 to 20,000. Over the past decade, a succession of soccer-oriented parks has opened across the league, including two this season that cost more than $100 million and are situated near rail stops in urban settings: the 25,200-seat Red Bull Arena, home to the New York Red Bulls, and the 18,500-seat PPL Park, home to the Philadelphia Union. While those teams are among the league’s top draws, the Revolution have slumped to 13th among 16 teams in attendance. The team currently averages fewer than 12,000 fans per game. Although the 69,000-seat Gillette Stadium easily sells out for the Patriots, it is a more challenging location, nearly 30 miles from downtown Boston, for a soccer club trying to establish a steady fan base. “We’ve seen the impact that an urban soccer stadium has made, and we are committed to creating that environment here in New England,’’ Bilello wrote. Kraft told the Globe last week that the stadium was not a question of financing but of ensuring the proper fit for a permanent home for the Revolution, including public transportation. “We are not under the gun, so we are going to do the right thing,’’ he said. The Inner Belt is adjacent to a neighborhood known as Brickbottom that, save for a set of residential artist lofts, is a no-man’s land of storage and heavy-equipment lots. Less than 2 miles from the State House and located within what Mayor Joseph A. Curtatone calls the “power triangle of MIT, Tufts, and Harvard,’’ the combined 200-acre Inner Belt-Brickbottom brims with potential for redevelopment, served by a Green Line stop. Curtatone has said the area could become the next Kendall Square. The state had committed to extending the Green Line by the end of 2014, but transportation officials disclosed this month that the project will be delayed at least 10 months, citing the debate over where to put the maintenance yard. The decision to move the facility a few hundred yards to the east will be more expensive, requiring the taking of four properties, including a 100,000-square-foot liquor wholesaler, that could cost $50 million. But state and local officials believe the move will pay off in redevelopment potential, including a possible stadium, said Michael Meehan, a spokesman for Curtatone. “It’s a potentially very interesting addition to the quality of life in the city,’’ he said.